Willard Wheatley had its best showing in years, placing second with 311 points. Joyce Samuel, who moved to the A Division this year, edged Ebenezer Thomas for third place by a point, 273-272. Francis Lettsome was five points back in fifth place with 267. St. Georges who held a four points lead over Althea Scatliffe following in the pre events, finished sixth with 228 points. Bregado Flax had 202 and Enis Adams rounded out the division with 193. 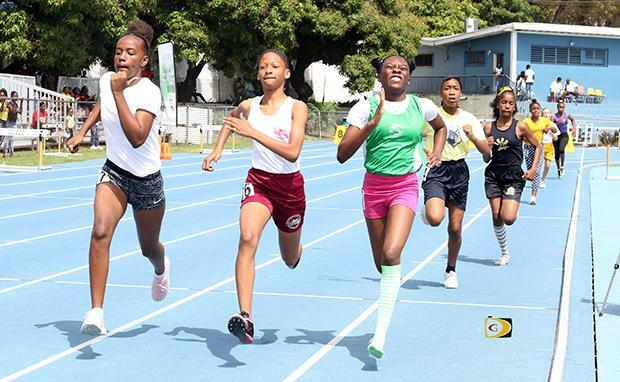 Althea Scatliffe's Nickelia Drummond, won the 13+ Girls Division with 30 points. Teammate Kalia Martin was the Under 13 winner with 28 points. Enis Adams' A'Sia McMaster edged Althea Scatliffe's Jahkyla Morton for the U11 Girls crown, 28-26. M'Kenzii Crabbe of Joyce Samuel and Carey-Ann Mickie of Bregado Flax, were joint U9 Girls winners with 18 points respectively. Francis Lettsome's Kadeem Pena had the top score in the 13+ Boys Division with 30. Kadair Maduro of Ebenezer Thomas also registered 30 points in the U13 Boys Division. Christopher Webster of Francis Lettsome finished with 21 points to claim the U11 Boys category. Althea Scatliffe's Tiondre Frett had 28 points in winning the U9 Boys Division. Francis Lettsome's Kadeem Pena and Kadair Maduro of Ebenezer Thomas, shared the Victor Ludorum award with 30 points respectively. Althea Scatliffe's Nickelia Drummond amassed 30 to seal the Victrix Ludorum.